The Pre-primary and Primary wings of Prestige Public School, INDORE have been innovatively designed to provide home-like atmosphere for imparting education under Montessori System and activity based learning program. It is recognized that the age from 2-6 years is the most impressionable period of child's growth. 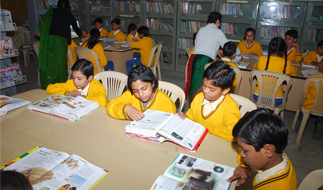 The informal and child directed early education program unique to PPS enriched by mind-stimulating activities geared towards development and encouraging intelligent exploration of surroundings. It will lay the foundation for academic readiness as well as responsiveness to develope other interests. The multi-purpose activity room in the pre-primary wing is warm, friendly, playful and pleasing. It is equipped with innovative toys and latest educational tools to promote integrated, intellectual, emotional, sensorial, linguistic, & physical development of the child with the input of civic habits. Another special feature will be the child counseling center where trained child psychologist teacher will focus on each child's potential aptitude and evolve sprit of working together. 3) Learning to live together.